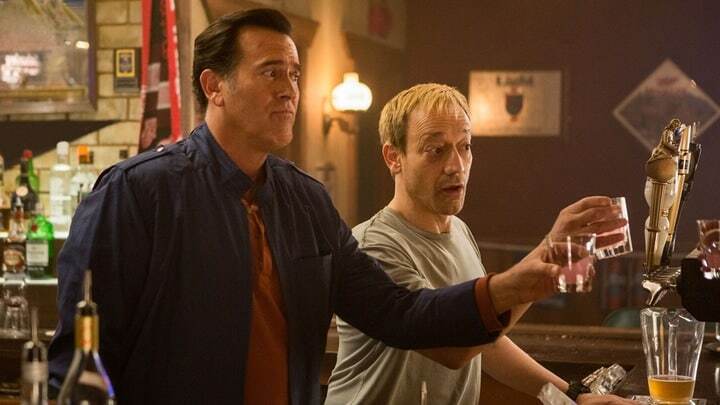 Ash vs Evil Dead this week starts out with the magic: Ash’s love for the Delta. Throughout Ash’s entire career of killing demonites the Delta was there for him; it even traveled through time with him. However, as Kelly said, it didn’t even have a CD player. (My thoughts were that it didn’t even have a 8-track player!). The episode sets up with a classic horror scene: five teenagers parked in the middle of nowhere getting intoxicated and at least one couple making out. When the make out scene gets too heavy for three of them they walk off to let the other two have their fun. While in the car (which of course is Ash’s Delta) the girl, Amber, calls a cool off period and discovers the Necronomicon and begins to read from it. She soon is ready to make out again, however, this time she is a little more active, seeing as she has become a deadite. She goes down on her boyfriend Tyler and bites his private part off. In the trailer, Ash and Ruby are fighting about how to get the book back. Ruby gives in and lets Ash go through with his plan which involves a drink called Pink F-ck. The drink involves Ketamine, liqueurs, and spirits. The scene switches to the bar where we are introduced to Chet Kaminski (who is played by Ted Raimi: this is an Easter egg for old time watchers who know he also played other characters in Evil Dead, Evil Dead II and Army of Darkness). Chet is Ash’s old high school friend, with whom he use to get extremely intoxicated. 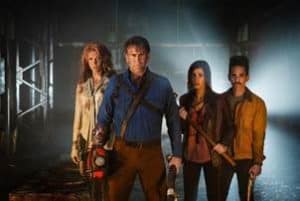 Their plan is to throw an epic party and get all the kids to come to the bar so Ash and the gang can find out who stole the Delta. Doesn’t look like the kids are going to make it, because back at the Delta the three other teenagers are making their way back to the car to find the back seat covered in blood. Calling for their friends, Tyler comes around the corner holding his bloody crotch. Amber is nowhere to be seen. A girl jumps into the Delta to turn on the lights to see better and the car surprises her by coming to life. Slamming the doors to trap her in, while taking a few fingers of another boy, the Delta spins around to throw a hub cap through him as he flees. With the girl screaming inside, the Delta takes off to chase down Tyler and the other remaining boy. Back at the bar, Brock comes in with his friends. Ash isn’t happy about his dad walking in, complaining that the creepy old man is going to scare the young kids away and he’ll never get his car back. Ruby corrects him: you mean the book. and Ash replies, “of course I mean the car.” Ash assigns Ruby to watch Brock while he starts questioning the kids at the party. Ash, of course, turns it into a drinking game to name the worst thing you have ever done. In walks Amber, ready to play the game with Ash. As Ash looks for who took the car, Kelly tries to help Pablo come to terms with these visions, which are preventing him from thinking about anything else. Chet chimes in to give his advice on how to deal with it by giving an example from when he was in Desert Storm, although it’s not clear if he was actually serving in the military. In the end, Chet’s advice is quickly dismissed and Kelly encourages Pablo to face his problem and fight it. This conversation doesn’t turn out very well for Kelly, as Pablo thinks he is complimenting her when he tells her that she is impressive for being able to go on when she has nothing in life: no job, no boyfriend and no home. His words actually bring Kelly down and she is left questioning where she is in life. Meanwhile, back with the Delta, the kids are not doing so well; the two boys are running from the car and have been split up. The Delta is on fire (literally) and ready to play, and once it tracks down Tyler’s it doesn’t give him a simple death. It gives Tyler hope first by pausing at the last second, and then takes him out. The car hangs in the air over Tyler’s head and then starts spinning the tire, coming down onto his head so that it removes Tyler’s face as it crushes his skull. Brock is taking this opportunity to get close to Ruby. He questions Ruby as to why she needs Ash. Ruby says she doesn’t know but there is something about him. Brock has come to the conclusion that Ruby needs Ash to make a baby due to her “clock ticking” and offers to step in for Ash. After all, they have the same ‘baby factory’ equipment! Brock is extremely talented at hitting on ladies while insulting them at the same time. Ruby has soon had enough and after making Brock apologize she leaves him to Ash. As usual, the Williams boys can’t be civil and decide to settle it like men (I verbally gasped yes at this moment, seeing Ash and his father go head-to-head is something I have been waiting for). ‘Settling it like men’ happens to be mechanical bull-riding and Ash is up first, making it for an impressive 15 seconds. Ruby is walking out and runs into Kelly, who is drinking on the street and feeling sorry for herself. Ruby sees this as an opportunity to enlist Kelly on her side on a mission to go after her children. Kelly calls her out on her needing to call Ash for help, only Ruby sees through this and uses it as an opportunity to tell Kelly that it was her she needed all along. Kelly, needing a sense of purpose and being extremely intoxicated, impulsively decides to join up with Ruby and help her kill her kids. Inside, Brock is on the bull and not only stays on longer than Ash, but is able to grab Amber onto his lap in the process, making it for 21 seconds. It appears that Ash has been shown up by his father again and Brock is going to be walking off with the girl. But before they part ways,Ash and his father finally have a real talk, where Brock admits that he doesn’t believe Ash’s story and thinks his son is a killer, not only a killer, but he killed his own sister. Brock accuses Ash of taking his daughter away from him. He calls Ash a monster. It is clear that these words hurt Ash deep to the core. As Brock and Amber walk away, she turns to let Ash and Pablo see her pupil-less eyes, and know they see she is a deadite. This time it seems that Ash doesn’t feel like being the hero and heads to the bar, seemingly uncaring of his father’s fate. A quick flash to the Delta shows that it has tracked down the last of the teenage boys, and despite his apologies and the girl’s cries, he is in for a gruesome death. At the bar, it’s Pablo’s turn to give the pep talk. Pablo reminds Ash of who he is and sends him to save his father, who is in the bathroom stall with Amber who is about to go down on him (We all know how that ended earlier with Amber’s previous boyfriend). Before she is about to do the deed, she shows her deadite self to a horrified Brock and Ash is quick to the rescue. It never amazes me the creative ways this show finds to kill a deadite and this scene is no exception, as the fight makes great use of the plumbing facilities in the men’s room. Ash and his father share a look that shows that Brock now believes him, but their moment is quickly ruined as a teenager walks in to see Ash with a head in his hand and a bloody chainsaw where the other used to be. The teen runs out screaming that Ashy Slashy (the nickname we learned from the first episode) is going to kill everyone and the bar quickly empties. Brock chases after everyone, out into the street, yelling for them to stop, that Ash is a hero and is going to save them. Ash finally has the approval he has been desperately seeking from his father. His father reveals that there is something he has kept from Ash which could be vital to his survival. As he begins to explain, the Delta runs him over; it seems we are not meant to know the answer… yet. However, we can’t help but wonder if this is correlating to what Ruby was saying earlier in the bar, about Ash being special. At the end of post-show credits, Ash comes on to let people know that if someone offers you a drink of Pink F-ck to throw it away. We strongly encourage you to follow his advice. Certainly the drink didn’t do so well for the people of Elk Grove! At least Ash can drown his sorrows in Pink F-ck when he realizes that Jacksonville is no longer an option. Do you watch Ash vs. Evil Dead? Join the conversation on FoCC!